For news organizations, one of the most significant elements of mobile technology is its potential to offer new revenue opportunities. Until now, news producers have struggled to generate revenue in the digital sphere to support local news. A variety of factors have contributed to this — from the fact that small local businesses may not be as quick to adapt to online advertising to the inability of news organizations to charge users for content online. Many in the news and information business hope that mobile will change that. Mobile offers news firms the chance to offer advertisers geo-targeted ads based on a user’s immediate location. Some media executives also believe that tablets may improve the consumer’s interface with advertising by making it work more seamlessly with other content – as opposed to the way that display advertising on websites often annoys news consumers. The apps available on mobile devices also offer news companies what the browser environment has not — a chance to charge subscription fees for content. 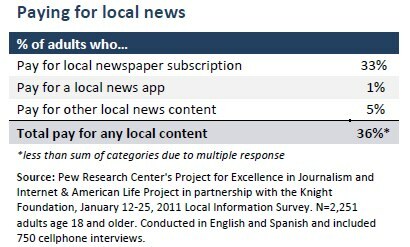 In addition, local news is a largely untapped and undeveloped market for news companies. Many local advertisers such as restaurant owners or small-business people are not yet online. At the same time, technology companies like Google and Facebook are moving more heavily into soliciting and enabling local advertising. To adjust to these changing circumstances, many news organizations are focusing new energy and resources on local news. They have reoriented staff away from national and international issues in order to expand operations in their own communities. One model of revenue generation that is garnering particular attention is the paid local app model. The local news apps used by 13% of adults who own mobile devices, or 11% of all adults, may encompass a wide range of applications, including locally focused news organizations, apps for broader sites likes Craigslist that provide online classified ads organized by community, and even more specialized apps such as the Girl Scouts’ Cookie Locator App, which helps users find the nearest location to buy Girl Scout cookies. Currently, only 10% of adults use mobile apps to connect to local news and information have paid for those apps, according to our survey. This represents only 1% of the total U.S. adult population. The vast majority access their local apps for free. This reflects a broader trend captured in the survey. A series of questions measuring paid local news content revealed that just 36% of adults pay for any local news content. For the vast majority, that comes in the form of newspaper subscriptions. One in three adults (33%) report paying for a local newspaper subscription; just 5% report paying for local news in some other form such as a blog or other online venue. Could those numbers increase if circumstances change? To find out, the survey asked about the willingness of people to pay for an online subscription to their local newspaper if the paper otherwise could not survive. People were asked “If the only way to get full access to your local newspaper online on your computer, cell phone or other device was to pay a … monthly subscription fee, would you pay it or not?” While currently 5% of adults report paying for local news content online, nearly a quarter (23%) say that they would be willing to pay at least a small amount if that were the only way to access their local newspaper. The survey also probed to what extent price is a factor. Half of the sample was asked if they would pay $10, and half of the sample was asked if they would pay $5. Price did make some difference. While 23%, said they would be willing to pay $5 per month, that figure dropped to 18% among respondents who were asked if they would pay $10 per month. In both questions, roughly three-quarters of adults say they would not be willing to pay for online access to their local newspaper, even if it was the only way to access the newspaper’s content. 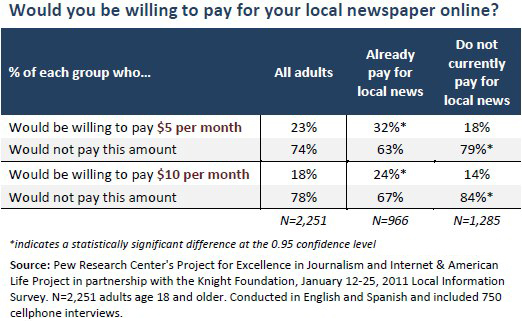 As one might expect, those who already pay for local news are significantly more likely to say they would pay a fee to access their local newspaper online. In what may be a positive sign to news organizations, adults who consume their news on mobile devices are more likely than other adults to say they would be willing to pay a fee. 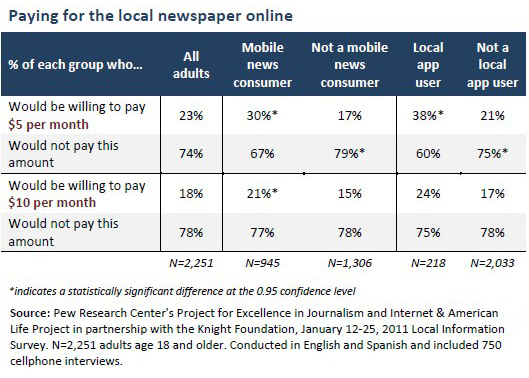 Mobile news consumers are almost twice as likely as other adults to say they would pay a $5 monthly fee for access to their local newspaper online (30% vs. 17%). And among local app users, 38% are willing to pay that amount. There is less enthusiasm among mobile news consumers and local app users when the proposed fee is $10 per month. The demographics of this cohort willing to pay did not stand out as very different from the population overall. College graduates and adults with household incomes of at least $75,000 are slightly more likely than the least educated and lowest income adults to say they would be willing to pay a monthly fee. And African-American (27%) and Hispanic (27%) adults are slightly more likely than white adults (18%) to be willing to pay a fee. The flip side of the question of who would pay online and how much, perhaps, is how much people might miss their local newspaper if it were to disappear. By a small margin, more people would seriously miss the paper if it died than said they would be willing to pay for it online. In general, though, respondents were split on the whether their ability to keep up with what is happening in their communities would be affected. 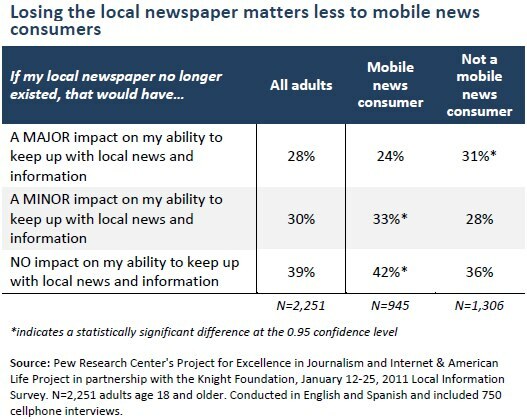 28% of adults said the loss of the newspaper would have a major impact on their ability to keep up with local information. Most likely to answer this way were adults over age 50, non-internet users, those who get news from multiple sources, those who had lived in the community more than 20 years and those who say they enjoy keeping up with the news. 30% said the loss of the newspaper would have a minor impact. This response was most common among adults from relatively high-income households and those with higher levels of educational attainment, adults who use multiple sources for news and mobile local news consumers. 39% said the loss of the newspaper would have no impact. Most likely to respond this way were younger adults (under age 50), those with broadband at home, those who say they do not enjoy getting news and those who usually get news from just one or two platforms. Those who currently pay for news would miss the paper more. Close to half of those who currently pay for local news (43%) say loss of their paper would have a major impact on their ability to keep up with what is happening in their communities (not surprising as most who currently pay are paying for their local paper). Still, one in five of those who pay for local news (21%) say that losing their local newspaper would have no impact on their ability to keep up with local news and information. How about those early mobile adapters? They would be far less bothered. Fully 42% said losing their local paper would have no impact on their ability to keep up with community news, and a third more said they the impact would be just minor. Who pays for local news? Who make up the people who currently pay for local news in some form or another? They are different from others in their community in some important ways. They are more likely than nonpayers to rate their community as excellent and to know their neighbors. They are also more likely to enjoy keeping up with news generally and to follow all kinds of news, including international and national news, closely most of the time. And while they are more likely to use a wider variety of news sources (40% use six or more on a regular basis, compared with 32% of other adults), they are also more likely to have a favorite local news source. Demographically, they are disproportionately white, female and older, and have higher household incomes and higher levels of educational attainment, and are more likely to be longtime community residents when compared with those who do not currently pay. Paying for local news is also much more common among adults who live in suburban or rural communities than among those who live in urban centers. These differences are almost entirely a reflection of the differences between who does, and does not, subscribe to their local newspaper.